And after we lost youtube-mp3.org, Convert2mp3.net received a great chunk of its traffic, and has now entered triumphantly the top 500 world’s most visited sites. The chart below says it all… Also do not mistake this site for convert2mp3.cc (another site with little traffic). Here we go, as it’s proven lately, let’s try again download Katy Perry Swish Swish. Opening youtube, doing a search and first result is here. So we go ahead and enter it into the first grey box. To the right of it there’s a drop-up list with possible conversion formats. We select mp3, for our quest today is youtube to mp3 conversion. next step is to click the CONVERT button a little more to the right. Ok, it’s understandable. When the site is SO popular as this one, it is “on the surface”, so it’ll be the first site copyright owners go to and try to disable their videos from being downloaded from youtube. They usually either threaten the website owner or simply go via set up channel, but eventually convert2mp3.net stops converting all the URLs that are somehow requested to. It’s normal. Site owner will better close off access to some URLs and keep getting ad revenue from 100s of 1000s of other URLs… In the big picture this does not affect anyone. People either try another video or go to another site. So we go ahead for another video of the same song. And again it’s a fail.. We try our third candidate. And yes oh yes, it works. Below is the screenshot of what it looks when convert2mp3.net actually agrees to convert the video. All we need to do here is wait a few seconds. on the next screen we can actually put our own ID tags into the mp3, so that it’ll show exactly what we want when played by any mp3 player. It can be the name of the song, or what we want to say, all up to us.. Also here we can preview the final mp3. You can also skip this page and avoid adjusting the tags. When ready, click CONTINUE. Step 5. Download youtube mp3 or save to Dropbox. Things are pretty straightforward now, all we need to do is click the big green DOWNLOAD button and the download happens. This screenshot below is a confirmation – it works! also there’s a little Save To Dropbox button to the right, circled in red. This one allows you to save the mp3 directly to your dropbox.com account. I cannot check or confirm its functionality, i am one of those who doesn’t use dropbox.. Out of principle… It tried to replace megaupload… no, sir!! 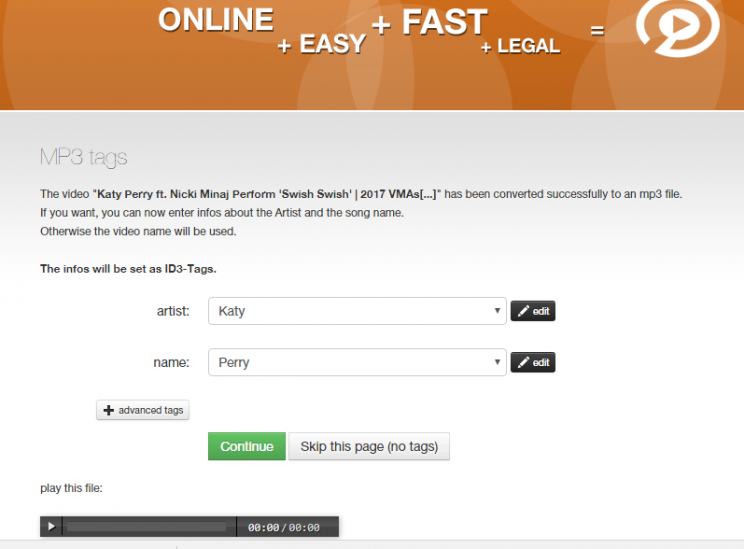 You can also see there that my mp3 is called “Katy – Perry.mp3”, – it is as i desired and entered on the previous page – artist = Katy, name = Perry… No surprise there. What surprised me was the ugly design… I think it’s time to make it into something more palpable. Look at keepvid or savefrom – both sites are in top 1000 world’s largest, and both are slick and nice. Same goes for many others, say theyoump3 looks quite nice, and ytmp3.cc does, and so do many others.. This is not a favorable review, and far from it.. Although this reviewer understands how hard it is to keep a site afloat amidst all these RIAA problems and DMCA reports and many other unpleasant things.. but the site has no malware, is safe to use, and has limited ads. so i am giving it 3 stars, mostly for old outdated design. Otherwise – keep at it!! and good luck! Telecharger-Youtube-MP3.com Review Tutorial Excellent Site! !